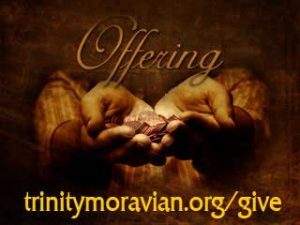 Your gift to God through Trinity Moravian Church helps to build the Kingdom of God in very real ways. Your gift helps us provide hope and spiritual guidance every week, to reach neighborhood children through our LOGOS ministry, to provide space for community events, to provide direct emergency assistance to families working hand-in-hand with Sunnyside Ministries. Your gift also helps to support worldwide ministries of the Moravian Church, including important mission ministries around the world and racial reconciliation efforts locally. Of course, your gifts are tax-deductible to the fullest extent allowed by the IRS. You will receive a receipt for tax purposes.